Winter's here in earnest. Halloween was (thankfully) warm(ish), but come the first of November, the snow's started, and yesterday we had almost a foot of snow. Now I'll be the first to admit that winter is not my season... but then I am grateful that it didn't start early this year like last year, where it was so bitterly cold in October. Winter this year is also mitigated for me, as I count down the days when I am heading to India for Christmas with Adz. + 28 C has never sounded so good! That said, I know I haven't posted for a few weeks here. For the first time in almost four years, I was really really sick. The flu's been around for a while, but I've never felt this sick in a long time. Its taken me almost two weeks to get back to normal, and I still have the odd twinge here and there along with a lingering tiredness which is incredibly frustrating. Add that, and a whole slew of other things, and its not been a great month one way or another. But thankfully, I am now feeling much better and normal service is resumed. And what better way to start off again, than with this classic street food snack? If you've lived or eaten in India, you can't have helped but noticed this ubiquitous snack everywhere. 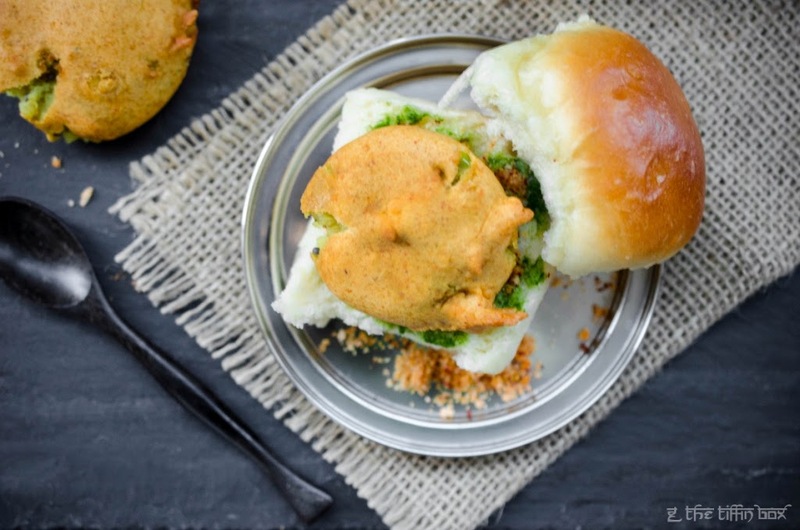 A staple of everyone from professionals to students to workers to kids, vada pavs are India's answer to sliders. The vadas are made with spicy mashed potatoes are shaped into patties, coated in gram flour and deep fried until crisp. They're similar in flavour to these South Indian bondas, but spicier and made with just potatoes. They are nestled into a soft, airy pav (bread roll), liberally brushed with tangy cilantro-mint chutney and a hot, dry garlic, red chilli and coconut chutney. If you wanted to up the spice factor, you could add a couple of fried long green chillies to the bun, all washed down with hot, sweet filter coffees or spiced masala chais or, in the summer, cold, creamy mango lassis. I was quite thrilled to notice this article in the Guardian a few weeks ago, and it featured one of my absolute favourite places in Mumbai for vada pav. It totally transported me to the hot, dusty chaos of the city, and memories of late nights hanging out with friends, trawling through the best street food addas (shacks) in town. A cast iron tummy is a must, but to be honest, street food is really where its at in India, and you'd really be missing out if you didn't eat any. As students, our budgets didn't quite stretch to the fancy coffee shops you can find in India nowadays, but those late night hunger pangs were usually satisfied with a run to the local pav wallah, and either a steaming plateful of pav bhaji or a couple of these utterly moreish vada pavs. If we felt fancy, then we'd also find a place that sold kheema pav (recipe coming soon), spicy minced meat in a bun. 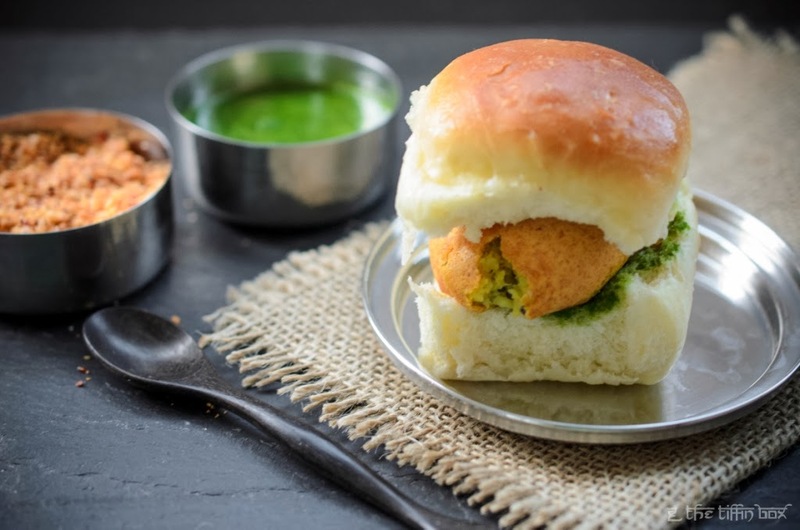 Making these vada pav at home is actually quite easy, as a lot of the components can be made ahead and you only need to assemble them just before eating. I used my mom's recipe for the vadas, and my own recipe for the pav. If you fancy making your own pav, I have the recipe on my Facebook page here. Most pav made in India tend to be dairy and egg free, but I like my version, as it's a little more richer, softer and airier. I like to brush my pav with melted butter as they come out of the oven for a softer crust. In my humble opinion, it really is the chutneys that make give this snack its uniqueness. Different vada pav stalls have different recipes. Some use a sweet tamarind and date chutney along with the spicier cilantro-mint and garlic-chilli-coconut ones, and its totally a personal preference as to how you assemble your pav. I skipped the tamarind chutney here, as my pav were a little on the sweeter side, and I felt that the cilantro-mint chutney added the freshness to this version of vada pav. But you can easily make your own chutneys and customise your vada pav the way you like them. I also mentioned earlier that you can add an extra layer of spiciness by frying whole green chilies, salting them with flaky rock salt, and eating them alongside the pav. I must admit I was a little too chicken for this, but it is a really brilliant combination too. I can't provide the heat and the dust, and the millions of passersby... but I can certainly provide the flavour of this classic street snack instead. Try it, and I guarantee you'll love it. 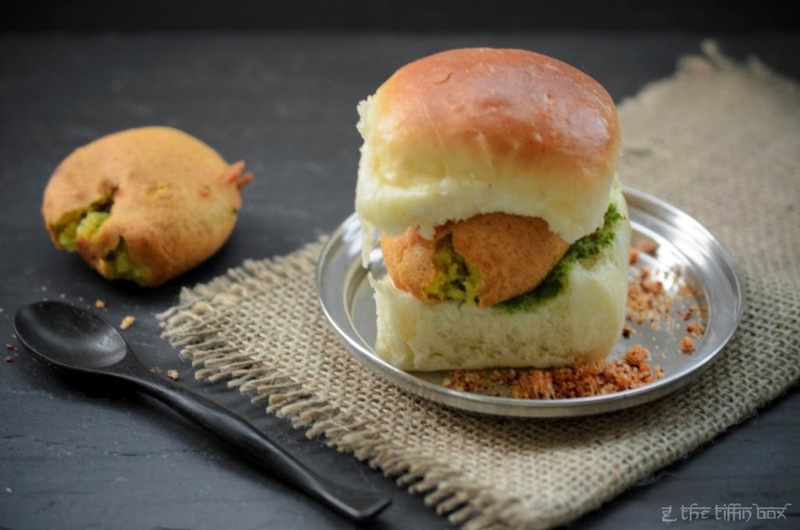 Have you had vada pav before? Would you try it? If you have, what's your style of eating this classic snack? The recipe for homemade pav can be found here. Boil the potatoes, until tender, and crush roughly. Keep aside. In a large pan, heat the oil, and add the mustard seeds and curry leaves. When the seeds start to splutter, about 30 seconds, add the garlic, ginger, green chillies and saute for a few seconds, until fragrant. Add the cayenne powder, ground turmeric and garam masala to the pan, and swirl the spices in the fragrant oil for a few seconds. Add the crushed potatoes to the pan. Mix well, and season generously with the salt. Take off the heat and leave to cool. Meanwhile, make the chickpea batter. Stir together the chickpea flour and the spices. Slowly add the club soda or sparkling water, to make a thick batter, the consistency of heavy cream. Season to taste with salt. Grease your hands with a little oil and shape the potato mixture into golf ball sized vadas (or larger, depending on the size of your pav). Dredge in the chickpea batter, and very gently, lower into the hot oil. Deep fry until golden brown and crisp, about 3 - 4 minutes. Take out using a slotted spoon, and leave to drain on absorbent kitchen paper. For the dry garlic-chilli-coconut chutney, blitz together the ingredients in a blender, until powdered. Taste and adjust seasoning adding more coarse sea salt, if required. For the cilantro-mint chutney, again, blitz together the ingredients in a blender, using a little more water, if required to make a smooth chutney. Season with a little extra salt and lime juice, if required. Split each bread roll/ pav in half. Butter it generously, and brush a good amount of cilantro-mint chutney. Place a potato vada into the pav, and sprinkle over the dry garlic-chilli-coconut chutney. Smush together the pav halves and enjoy with a hot cup of chai or filter coffee or some cold, sweet mango lassi. I love the recipe and the awesome pics with this one! heehee and of course the less cilantro as needed! As an aside, I'm trying to figure out if I should keep the spam moderation on mine too as people have been having trouble with just leaving comments. good but Where did you get the Pav from? I made them myself. Check out the link to my Facebook page in the post, and it will give you the recipe. Enjoy. I love vada pav. Thanks for the recipe! love vada pav. Thanks for the recipe!